January 4, 2010 Adri H.
One of the easiest patterns I've ever knitted, and one of the most satisfying. It's a very practical, comfortable, and lovely design, and I hope that some of my work ends up in this category. This is "Bond" designed by Kim Hargreaves. Her work is often featured in Rowan knitting as she was a designer for Rowan for over twenty years. The original "Bond" is supposed to be long-sleeved or 3/4 sleeves, but seeing as I had 20 grams of yarn left after finishing the bodice and collar, I improvised with cap sleeves and the end result is exactly what I wanted. I used Alpaca with a Twist's "Baby Twist" Jumbo Hank in Carnival Red. -Dec 2 at neck edge (i.e. right-front - K to 5sts remaining K2tbl K1 K2tbl) and continue decreasing two sts on every alternate row until 6sts remain on needle. -Dec 1 st on neck edge (i.e. right-front- K to last 2 and K2tbl) every alt row until 3 sts remain. -Work 1 row, then bind off remaining 3 sts. Knitted only 1.25” for collar. 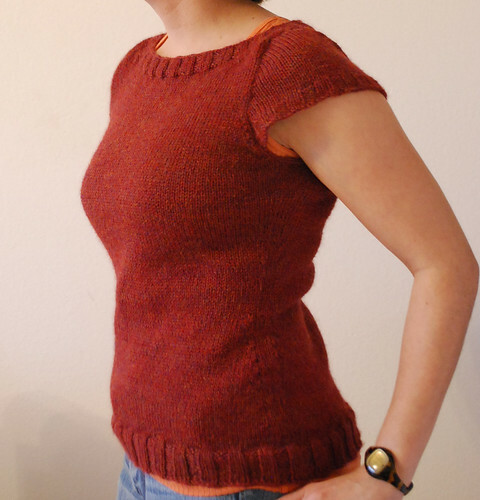 I also knitted cap sleeves instead of long sleeves or 3/4 length sleeves. CO 18 sts with 4mm needles and on every RS row, inc 1 st on each end (i.e., +2sts every RS row). I used the knit through front and back loop method to increase on the ends. When piece measures about 4” from cast on row, switch to 3.5mm needles and K3,P3 rib for an inch to match collar. Bind off. If you have more yarn than I did, but wish for short sleeves, I recommend following the instructions for the sleeves here. The pattern is in German, but you can see the diagram at the bottom (in cm) to get the idea.